This is, of course, the first and the most obvious suggestion you might have already guessed yourself. Simple hi-fi stand design will look very impressive in a room, already decorated with glass and metal. Also, check out a couple of adjustable stand models any time you are working on a hi-tech setting — usually, they look right in place in modern rooms. Some metal TV stands also have wooden inserts — base, shelves, etc. This makes them perfect additions for traditional rooms with a modern focus. If you are fond of the good old classics, but still like to stay in trend, a metal TV stand with wooden inserts is one of the most durable and stylish solutions you can consider. Yes, it is even possible to find a perfect match for vintage interior. Here, however, you will have to pay attention to stylish in-wrought metal — after all, plain even surface designs will never fit into an antique environment. Stylishly in wrought models, on the contrary, will. They will offer an exquisite decoration solution for practically any vintage theme. Another interior where you can easily install metal TV stands is futuristic interior. It can accommodate the simplest, the most basic model with just a couple of metal shelves. However, if you are trying to create a very consistent decoration picture, pay attention to metal stands in a stylish round frame. Finally, there is another interior sub type that can benefit from metal TV stands — and that is retro interior with industrial focus. For this decoration theme, pay attention to bulky metal stands with wheels, designed in a chest-like style. The models are not only rare and memorable, but are also incredibly durable. 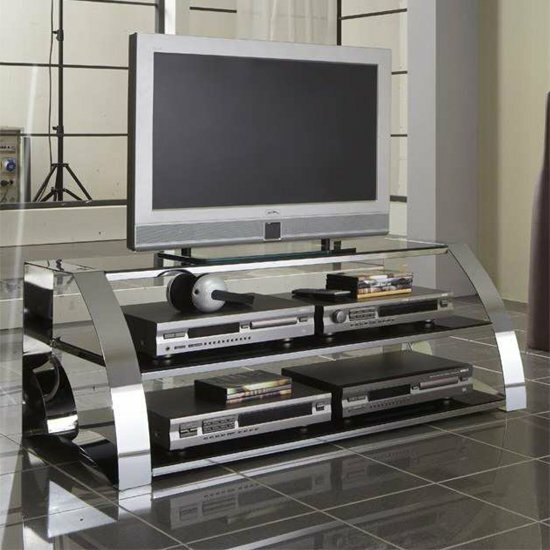 For more suggestions on metal TV stands, check out any furniture store. In the UK, a very nice example is Furniture in Fashion . This platform offers an enormous selection of stylish interior decoration solutions, so you will probably find more than one model to your liking. Moreover, the company features a very moderate pricing policy, which is another great plus. Yet, what is really important is that the quality of very single piece is in full accord with high international quality standards — this company carefully chooses its suppliers, working only with the best of the best UK and European manufacturers. And, as a local company, it processes and delivers all orders quickly.